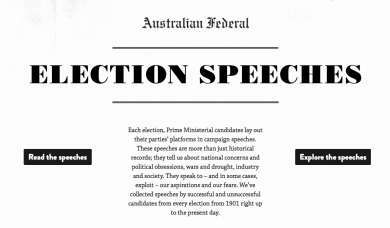 Each election, Prime Ministerial candidates lay out their parties’ platforms in campaign speeches. These speeches are more than just historical records; they tell us about national concerns and political obsessions, wars and drought, industry and society. They speak to – and in some cases, exploit – our aspirations and our fears. This collection contains the full text of campaign speeches by successful and unsuccessful candidates from every Federal election from 1901 onwards, as well as word-frequency visualisations, reading-level analyses and API access to the dataset.